The "Golden Age of Zen" refers to Ch'an in the Tang Dynasty, from Hui-neng through the "five houses" of his successors. The Tang Dynasty lasted from 618 to 906-907 AD, and Buddhism became the dominant ideology, being adopted by the imperial family. But in 845 Emperor Wuzong "shut down 4,600 Buddhist monasteries along with 40,000 temples and shrines, forcing 260,000 Buddhist monks and nuns to return to secular life" according to a Wikipedia article. Apparently the ban was lifted a few years afterward, but Buddhism didn't regain its dominance. The Tang Dynasty was succeeded by half a century known as the Five Dynasties and Ten Kingdoms era, which in turn was followed by the Song Dynasty from 960 to 1279 AD. During the Song rule, Ch'an Buddhism once again flourished, guided by notable Ch'an masters such as Dahui, Foyan and Mi-an. 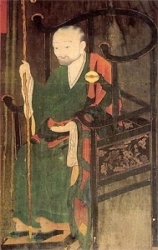 Dahui was the 12th generation of Zen masters in the Lin-chi (Japanese: Rinzai) tradition. Lin-chi, whose teacher was Huang-po, died in 867 AD. Dahui advocated koan, or kung-an, practice as the fastest way to enlightenment, but he suppressed his own teacher's collection of such teaching stories and conundrums (Blue Cliff Record) because it had become superficially used as intellectual study material. He was a vigorous critic of the Caodong (Ts'ao-tung; Japanese: Sōtō) tradition, which he termed "the heretical Ch'an of silent illumination." Master Yuan-wu ascended the high seat in the lecture hall at the request of Madame Chang K'ang-kuo. He said, "Once a monk asked Yun-men this question: 'Where do all the Buddhas come from?' Yun-men answered: 'The East Mountain walks over the water' (Tung-shan shuei sheng hsing). But if I were he, I would have given a different answer: 'Where do all the Buddhas come from? As the fragrant breeze comes from the south, a slight coolness naturally stirs in the palace pavilion.' When I heard this, all of a sudden there was no more before and after. Time stopped. I ceased to feel any disturbance in my mind, and remained in a state of utter calmness. It is indeed not easy to arrive at your present state of mind. But unfortunately, you have only died but are not yet reborn. Your greatest problem is that you do not doubt words enough. Don't you remember this saying? "When you let go your hold on the precipice, you become the master of your own fate; to die and afterward come to life again, no one can then deceive you." Yuanwu then gave Dahui the koan, "To be and not to be  it is like a wisteria leaning on a tree" to work on, and after six months Dahui achieved the final breakthrough. The following year, 1126, the Manchus captured the Song capital along with the emperor. The capital was moved south to Hangzhou under a self-appointed new emperor, and the Southern Song dynasty began. Dahui also moved south, and in 1137 the prime minister, who was a student of Dahui, appointed him as abbot of the Ching-shan monastery in the capital. Within a few years his sangha grew to two thousand monks and laymen, including many high-ranking officials, and Dahui became the leader of Buddhism in the Song dynasty. Foyan was an active volcano producing paradox and consternation for his listeners. The following excerpts are from Thomas Cleary's translation of Instant Zen. If you don't ask, you won't get it; but if you ask, in effect, you've slighted yourself. If you don't ask, how can you know? But you still have to know how to ask before you can succeed.... Remember the story of the ancient worthy who was asked, "What was the intention of the Zen Founder in coming from India?" Amazed, the ancient said, "You ask about the intention of another in coming from India. Why not ask about your own intention?" I see that symptom frequently, and people fall back into it sleepily even after it's pointed out. When my teacher [Wuzu Fayan] was with his teacher, his teacher used to say, "This path is a natural subtlety attained by oneself," generally focusing on the existence of innate knowledge. I always tell you that what is inherent in you is presently active and presently functioning, and need not be sought after, need not be put in order, need not be practiced or proven. All that is required is to trust it once and for all. See "The Mind of Absolute Trust" by Seng-Ts'an, the 3rd Patriarch of Ch'an, for a classic and beautiful exposition of trust in what's within. ... Just because I wondered deeply, I later attained penetrating understanding.... If you do not reflect and examine, your whole life will be buried away. Whatever you are doing ... there is something that transcends the Buddhas and Zen Masters; but as soon as you want to understand it, it's not there. It's not really there; as soon as you try to gather your attention on it, you have already turned away from it.... Does this mean that you will realize it if you do not aim the mind and do not develop intellectual understanding? Far from it  you will fail even more seriously to realize it. Even understanding does not get it, much less not understanding! The above quotes all came from just the first ten pages of the book. Those who have not learned are in confusion; not relying on the source, they abandon their families, quit their jobs, and wander around in misery, running north and south looking for "Zen" and "Tao" and seeking "Buddha" and "Dharma" on the tongues of old monks all over the land, intentionally waiting for their "transmission," unaware they have missed the point long ago. only then do you have some independence. all day long without it affecting you. The reason this path has not been flourishing in recent years is nothing else but the fact that those who are acting as teachers of others do not have their eyes and brains straight and true. They have no perception of their own, but just keep fame and fortune and gain and loss in their hearts. Deeply afraid that others will say they have no stories, they mistakenly memorize stories from old books, letting them ferment in the back of their minds so they won't lack for something to say if seekers ask them questions. 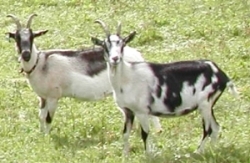 They are like goats crapping: the minute their tails go up, innumerable dung balls plop to the ground! Since students do not have clear perception, how are they supposed to distinguish clearly? Students believe deeply, with all their hearts; so unseeing individuals lead unseeing crowds into a pit of fire. Ch'an Masters Home Page | Other Ch'an Masters (Tang Dynasty) | Self-Discovery Portal | Stumble It!